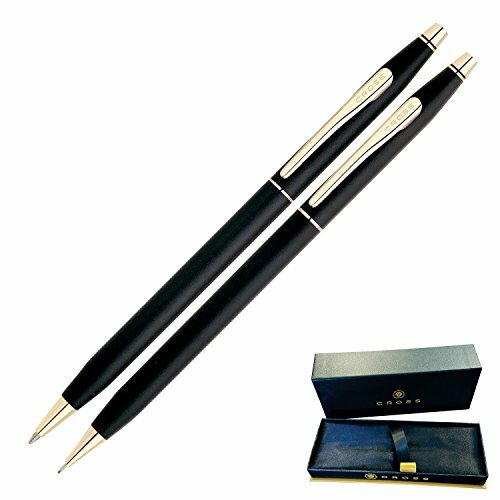 AT Cross Pen and pencil set, Black with Gold trim in the slimline design. Comes a Cross pen case. Comes with medium black ink in the pen and 0.7 mm lead in the pencil. Free engraving included 1 line of 24 characters in block or script font. Personalized gift pen and pencil set. We engrave the same on both pen and pencil. Free engraving included, up to 24 characters max. Engraving shows up a light brass color. Twist action black ballpoint pen and 0.7mm pencil. Gold plated trim. Genuine Cross quality with lifetime mechanical warranty- Comes in a Cross pen case. Black medium writing ink in pen. Quality gift for first job, award, graduation, birthday, men or women. Engraved in house at Dayspring Pens and ships out fast in 1-2 business days. If you have any questions about this product by Dayspring Pens, contact us by completing and submitting the form below. If you are looking for a specif part number, please include it with your message.